DURHAM, N.C. — Hundreds of thousands of sharks, sea birds and other marine species are accidentally killed each year after they become snagged or entangled in longline fishing gear. "This represents a movement away from a reactive approach to fisheries management — where we only know about problems as or after they occur — to a more proactive approach that helps us stay one step ahead of the game," he said. Then they statistically correlated each ship's fishing efforts to 14 environmental variables — such as sea surface temperatures or distance to the nearest seamount — that influence a region's seasonal suitability as a habitat for species targeted by longliners. 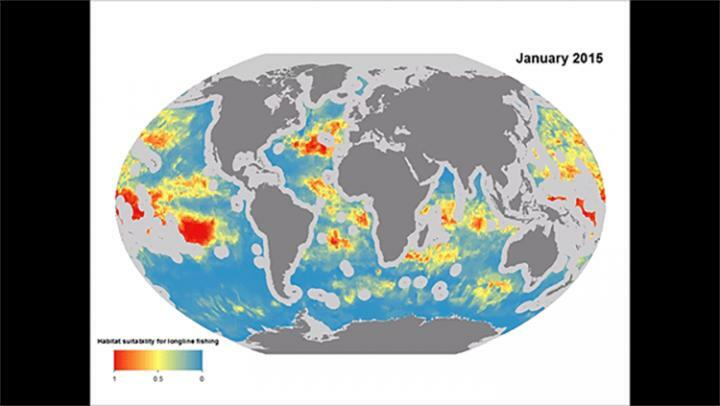 This allowed them to create highly accurate models that predict where the fishing fleets will be each month of the year. Ortuño Crespo and Halpin conducted the new study with Daniel C. Dunn of Duke; Gabriel Reygondeau and William Cheung of the Nippon Foundation Nereus Program and Changing Ocean Research Unit at the University of British Columbia; Kristina Boerder and Boris Worm of Dalhousie University, and Derek P. Tittensor of Dalhousie and the United Nations Environment Programme's World Conservation Monitoring Centre.